NEW! 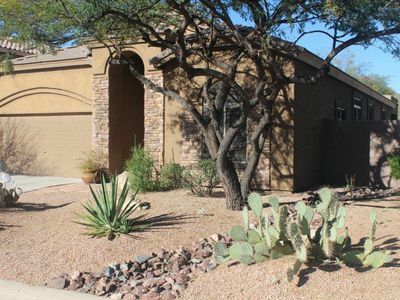 5BR Scottsdale House w/Resort-Style Backyard! 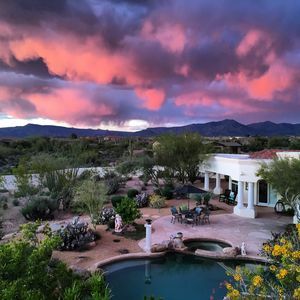 The ultimate Arizona getaway awaits you at ‘Verde Estate,’ a 5-bedroom, 3-bathroom vacation rental house which comfortably sleeps 16-20 in Scottsdale. 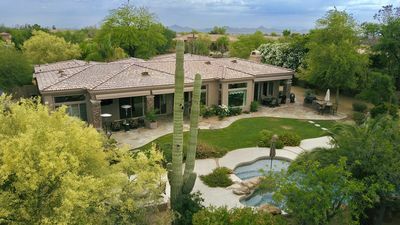 Situated minutes from numerous golf courses, superb shopping, and endless attractions, this home features a prime location and a resort-style backyard with a pool, waterfalls, hot tub, fire pit, putting green outdoor pool table, and more for a memorable retreat! 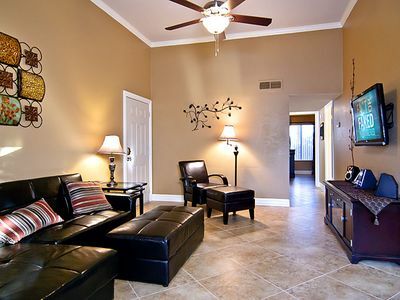 This completely renovated estate has been fully remodeled inside and out and has been optimized for your entertainment. 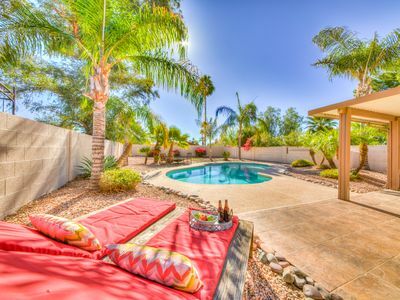 The amazing, tropical yard is your own private oasis with professional landscaping, new tropical plants, private pool and hot tub, grass area with bean bag toss, yard bowling and croquet, 10 poolside lounge chairs, outdoor BBQ, a putting green, and a fire pit! 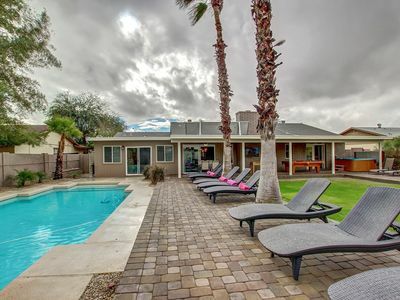 Also outside, the 60-foot covered patio has a pool table, foosball table, outdoor TV and comfortable patio furniture, all for your maximum enjoyment and relaxation. Step inside the 2,520-square-foot home to find more beauty throughout the completely renovated abode. With a fireplace, cable TV and new comfortable couches, the open concept great room’s design is perfect for today’s entertaining lifestyle. In the upgraded, fully equipped kitchen, you’ll find granite countertops, stainless steel appliances, a wine bar island and formal dining table, making it easy for you to prepare and serve your favorite recipes. 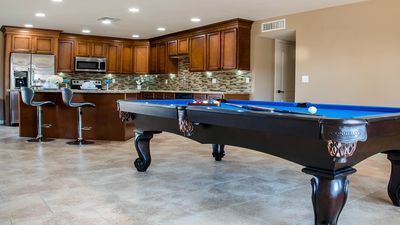 The home also features all new furniture, flat-screen TVs in every room with expanded TV channels and the sports network (55-inch TV in the great room) and 50 meg high-speed wireless internet access. When you’re ready to call it a day, retreat to any of the inviting bedrooms, where comfortable beds ensure peaceful slumbers. 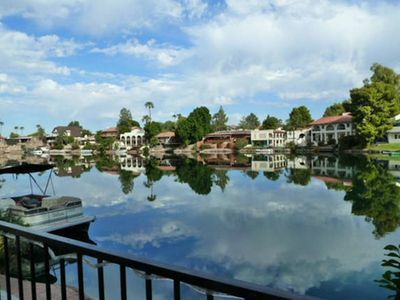 Although you’ll surely find it easy to spend most of your time relishing in the resort-style amenities at your private oasis, you’ll still want to explore the surrounding areas of this ideally-located home. 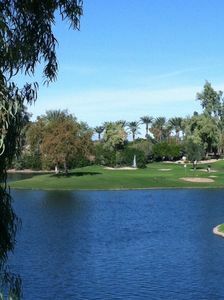 And Talking Stick Golf Club (10 miles). Shopping lovers will be happy to go on a shopping spree at one of the numerous shopping locations within a few miles from the property, including Kierland Commons (2 miles), Scottsdale Quarter (2 miles), Scottsdale Fashion Square (10 miles), Old Town Scottsdale (10 miles), Desert Ridge (2 miles), and Biltmore Fashion Park (15 miles). 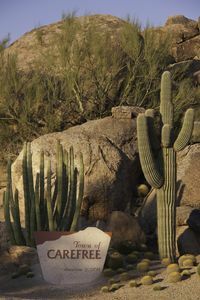 For outdoor activities, enjoy hiking the mountain trails, biking the numerous paths, taking desert Jeep tours, going on hot air balloon rides and catching professional sports games, including the Phoenix Suns, Phoenix Coyotes, Arizona Diamondbacks, and Arizona Cardinals. 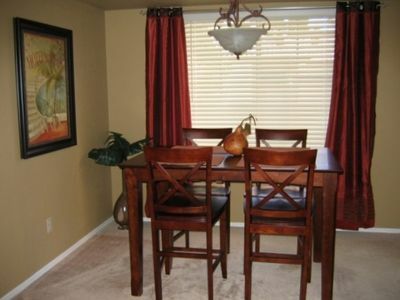 Minutes from the airport, this home makes it easy to get to and to depart at the end of your vacation! 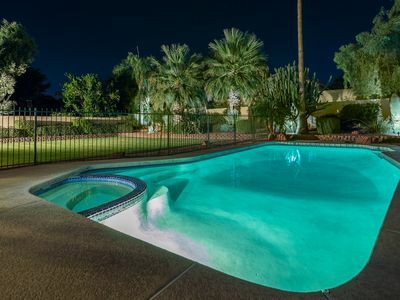 - Enjoy the spacious resort-style private backyard with an above-the-ground hot tub, a pool (which can be heated for an additional fee), putting green, waterfalls, fireplace, yard bowling, pool table, outdoor furniture, tropical gardens, BBQ grill, and fire pit conversation area! 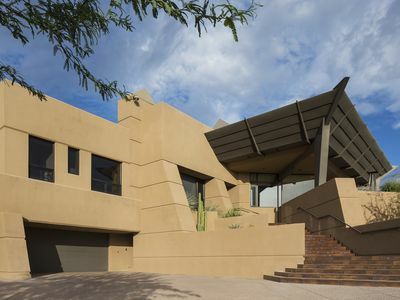 - Fantastic Scottsdale location - Just minutes to Old Town Scottsdale, ASU/Mill Avenue, Tempe Marketplace, Casino Arizona and Sky Harbor Airport, hundreds of great restaurants, shopping, golf course, hiking trails, biking paths, baseball Spring training, and quick access to 101 and I-60 freeways! Enjoy the warmth of the sun in AZ!!! 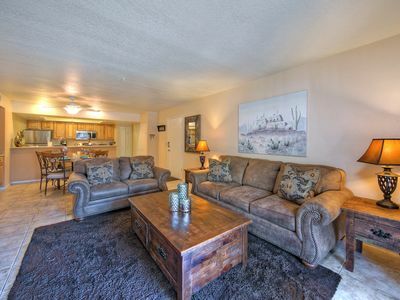 2BD, 2BA Minutes From Old Town Scottsdale!! Las Sendas Vacation Home W/ Pool... Golf & Arizona Sun! !